Abstract: Information technology becomes one of the important elements for an organization or company in realizing the effectiveness and efficiency of performance. To create a company that has a good performance, it requiring the existence of an information system to assisting the management in taking a decision. In its implementation, the use of existing information system still encounter some obstacles during the operation. In this study, the authors used application belongs to Mail and Logistic (MLO) agenpos application. Therefore, SWOT analysis is needed to know the strengths and weakness in internal factors and to know the opportunities and threats in external factors. Choosing the right strategy can maximize the strengths and opportunities, on the other side can minimize the weaknesses and threats. Abstract: Along with improvement of modern electronic games, necessity of an intelligent agent that easily build is needed. One of electronic games that need good intelligent agent is real-time tactics. In this game type, good action planning is necessary to provide best experience to the player. Abstract: — Motorcycle theft often occurs due to many factors other than the theft of a motorcycle helmet is now rampant theft occurs, in this study the authors focus the security both of these by using the communication system master slave on a bike motorcycle and helmet so it can trigger an alarm when a helmet or motorcycles stolen and for additional security features were added to the tracking using the GPS module and GPS tracker bravo so give extra safeguards on the motorcycle and helmet .Keywords— Master slave; GPS; The alarm; Motorcycles; Helmet. Abstract: Oil insulation is one of the insulation medium types commonly used in high voltage apparatus. This insulation is to separate between the conductive part and non-conductive part. However, oil insulation can experience decreasing of dielectric strength. It may be caused by the presence of solid particles. Therefore, the testing was conducted to obtain the effect of solid particles to characteristics of partial discharge and breakdown voltage of oil insulation. 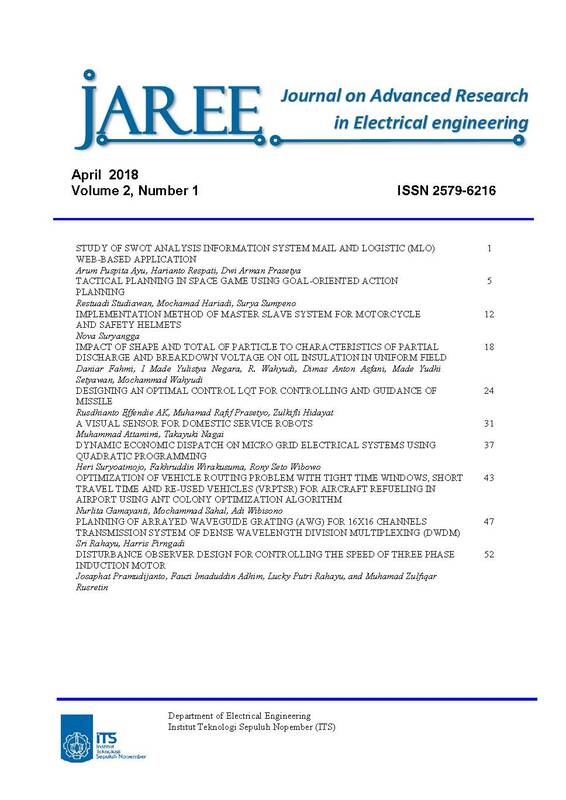 The results generally proved that the existence of solid particles can reduce the breakdown voltage value of oil insulation. In addition, the solid particles led to two types of corona on oil insulation, namely positive and negative corona. Abstract: Missile has to be controlled and follow the commanded guidance in order to make its flight hit the target. Since missile has a nonlinear characteristic and coupled dynamic equation, controlling a missile has become more complex. Linear Quadratic Tracking (LQT) is one of optimal control theory where its objective is to make the output of a system tracks its reference as close as possible while minimize or maximize a desired performance index. In this paper, an autopilot for missile is designed which consists nonlinear state feedback decoupler and LQT controller. Pursuit Guidance is used for the guidance law. A missile-target engagement simulation is created using 2 kinds of target; static target and dynamic target. By using static target, the mean of the closest distance between missile and the target is 0.45 meters and by using dynamic target the mean of the closest distance between missile and the target is 2.562 meters. Abstract: In this study, we present a visual sensor for domestic service robots, which can capture both color information and three-dimensional information in real time, by calibrating a time of flight camera and two CCD cameras. The problem of occlusions is solved by the proposed occlusion detection algorithm. Since the proposed sensor uses two CCD cameras, missing color information of occluded pixels is compensated by one another. We conduct several evaluations to validate the proposed sensor, including investigation on object recognition task under occluded scenes using the visual sensor. The results revealed the effectiveness of proposed visual sensor. Abstract: Currently the needs of electric power increased rapidly along with the development of technology. The increase in power requirements is contrary to the availability of sources of energy depletion of oil and coal. This problem affects the national electrical resistance. To meet the needs of large electric power with wide area coverage is required small scale distributed power generation. This distributed generation (DG) of renewable energy sources sought to minimize the use of energy resources such as oil and coal and connected to the micro grid and use the battery as a power balance. Because of there are many DGs and the use of batteries, therefore it is important to determine the optimal power generation of each plant as well as the use of battery based on the optimal capacity so that requirement of electric power can be met with minimal cost each time. This optimization is known as Dynamic Economic Dispatch. In this study, the methods of Quadratic Programming is required to solve the optimization problem. Abstract: Scheduling in aircraft refueling has an important role in aviation. Scheduling of aircraft refueling is called Airport Ground Service Scheduling (AGSS) that can be formulated as Vehicle Routing Problem with Tight time windows, Short travel time and Re-used Vehicles (VRPTSR) This research is focusing in scheduling design for aircraft refueling with refueller truck in Juanda Airport, Surabaya, so minimum amount of truck will be used using Ant Colony optimization. The result shows that Ant Colony optimization could do scheduling in refueling well so minimum amount of truck will be used. Abstract: Arrayed Waveguide Grating (AWG) Technology, one technique of dividing the channel into smaller sub-channels by adjusting the fixed array length increment. AWG techniques can generate coherent transmissions, which are suitable for Wavelength Division Multiplexing (WDM), to be implemented as multiplexer, demultiplexer, filter, add-drop device, and more. This paper discusses the design planning of AWG parameters operating on C-Band channels (1530-1560 nm), to support the needs of WDM channels, especially Dense-WDM (DWDM). Planning is done using WDM-Phasar tool and through theoretical calculations with MatLab. Theoretical calculations aim to produce ideal design parameters, while through WDM-phasar by adding the device size limit, crosstalk and nonuniformity values, it is expected to obtain more realistic design parameters. The parameters observed include the magnitude of the diffraction order (m), the length of the free propagation range (FPR), the difference in array length (ΔL), the number of arrays (Narray), number of I/O (Nmax) and free spectral range (FSR) channels. By using 16 channels of 100 GHz (0.8 nm) in the C-band, the size of the device (15000x9000 μm2), crosstalk (-35 dB) and nonuniformity (0.5), through WDM-Phasar assistance the AWG parameter 1197.347 μm (FPR), 23.764 μm (ΔL), 41 (m), 56 (Narray), 16 (Nmax) and 11.2 nm (FSR). While ignoring the device size, crosstalk and non-uniformity variables, theoretical parameters were generated at 1308.61 μm, 25.1698 μm, 43.7143, 108 pieces, 27 channels and 21.211 nm, respectively for FPR, ΔL, m , Narray, Nmax and FSR. or WDM system capacity (16x16). Abstract: Induction Motor is a type of motor that is most widely used in industry compared to other electrical motors, because this type of motor has several advantages such as construction simplicity, sturdiness, cheap prices and low maintenance need. But the main challenge is to keep the speed remain constant when the induction motor is given many various values of load until particular value of the load nominal is given, so the response of the motor will change varily even if a controller has been given, thus controlling the speed of three phase induction motor is much more difficult to do. Therefore, in this research, we applied Disturbance Observer (DOB) method using Proportional Integral Derivative (PID) controller. This method was chosen because it can automatically reduce or even eliminate the disturbance, which is in the form of load and the measurement noise. The use of PID controller was expected to enhance the motor’s time settling. The test result of the Disturbance Observer method shows that it can reduce the measurement noise in every loading scenario. While the simulation result shows that the response of PID controller + DOB are capable of approaching the nominal load response with a response specification of 0.1 % of plant error, overshoot or undershoot of 1.5 %, time settling (ts) 5 % by 7.1 seconds and time rises (tr) of 2.2 seconds.